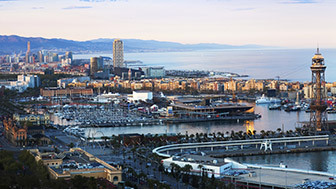 Barcelona has an extensive road and motorway network linking it to Catalonia and the rest of Spain. The border with France is only 150 kilometres away. It is also possible to travel by car to North Africa via Algeciras, where you have to take a ferry. 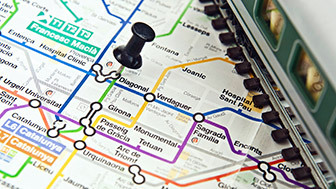 You can get into the city from the two ring roads, the Ronda del Litoral and the Ronda de Dalt, or take the Avinguda Meridiana right into the centre. If you are coming from the rest of Spain and approaching from the south, take the AP-7 or C-32. The autopistes and autovies offer the fastest way of getting to Barcelona. They are toll roads identified by their blue signs. The Vallvidrera Tunnels link the city centre with the main Vallès towns to Manresa, with links to other roads and motorways along the way. The Cadí Tunnel is the quickest way to travel from Barcelona to the Cerdanya region and Andorra. For getting round Catalonia, there are always alternative routes to the motorways using county and national roads, although these are generally slower. County roads are indicated by an initial C, while national roads are indicated by an N and local roads by an E.
The Ronda de Dalt and the Ronda del Litoral go round the north and the south of the city. The Ronda de Dalt starts at the Nus de la Trinitat, where it connects with the motorways, and ends at the Nus del Llobregat. It goes round the upper part of the city. The Ronda del Litoral follows the coastline for 20 kilometres and connects with the autovies and autopistes at the Nus de la Trinitat, where the two ring roads meet.